Without radio, television or anything similar to the Internet, at the beginning of the 20th Century, newspapers were the main media outlets and the easiest way to advertise while reaching a large number of consumers. The hardest part was to capture their attention among thousands of advertisements. A.E. Pickard definitely knew how to do that. He understood that the key was not only to catch the eye of the reader, but also the attention of the journalists. 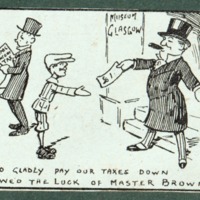 License problems at the Clydebank Gaiety Theatre or the new application of entertainment services taxes were seen by Pickard as an opportunity to be present in the news. The connection to current issues also helped. 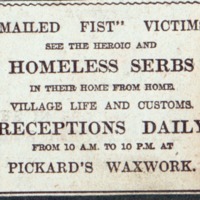 Offering a price for flying over Glasgow in an aircraft, giving a place to workers for assemblies, or taking Serbian refugees from the Great War were stories attractive enough to find a space in the newspapers, giving Pickard free publicity. He knew how to run the show by using humorous phrases (Pickard Unlimited), catchy slogans (Pickard’s Popular Prices), publishing the upcoming week’s programmes every Friday and creating expectations with incredible shows. He was able to capture the attention of the people even in small advertisements with a technique that is more common now than it was then: Getting people involved through crowdsourcing. Pickard offered prizes to those who gave him funny honorary titles, such as ‘the Shah of Stockwell’ or ‘the Camlachie Columbus’. 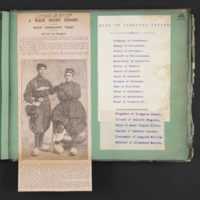 Those titles were wisely included in his advertisements, making people look for their contribution through the newspaper. By 1909 he was a well-known member of the Glasgow society and one of the most successful entertainment businessmen in the city. Using his reputation, he made a brand of himself, synonymous with up-to-date, ahead of its time, and high quality entertainment. 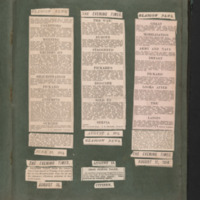 He started to use the names Pickard’s Panopticon, Pickard’s Glasgow Casino, and Pickard’s Ibrox Cinema. He also tried new approaches to get the public’s attention. 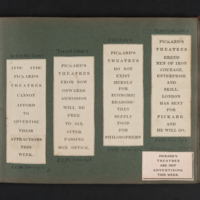 In 1916 he inserted a series of advertisements like this: ‘Pickard’s Advertisement suspended for one week by order of Pickard’. This was enough to be the talk of the city and get the recognition as a clever man in advertising.